Kunlé Adeyemi of NLÉ Works, the architect of the pavillion for A Prelude to The Shed, inside the structure. Photo: Timothy Schenck. We talk to Kunlé Adeyemi about his design of A Prelude to The Shed. Kunlé Adeyemi is helping launch New York City's latest innovative arts center, The Shed. The Nigerian-born architect, designer and urban researcher is the person behind the transformable structure of Prelude, a temporary space built ahead of the launch The Shed in 2019. Kunlé, who has completed projects like the widely-covered Makoko Floating School with his company Nlé Works, collaborated with artist Tino Sehgal for the Prelude space, which features a fluid structure that can be reconfigured to the desire of the artists and performers. 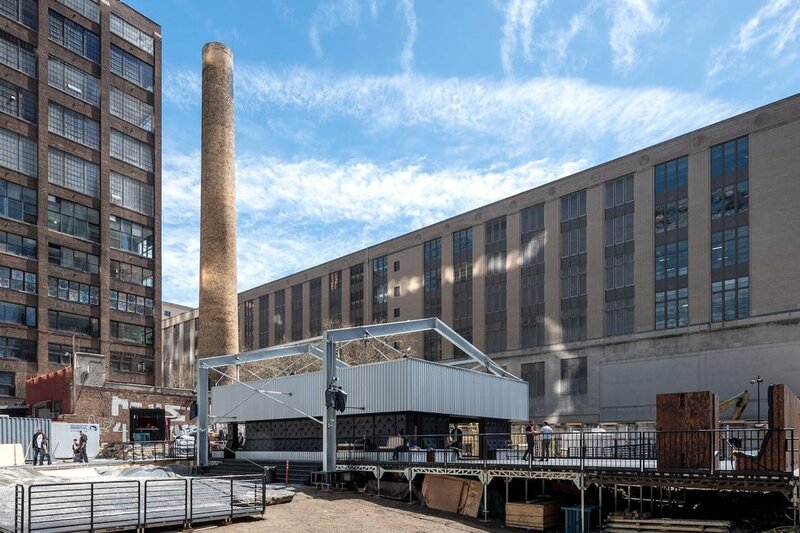 A Prelude to The Shed is set to open May 1 with several free events that will features performances from the likes of Azealia Banks, ABRA, Arca, and others. You can see the full schedule here. Read ahead for our conversation with Kunlé Adeyemi about his work behind this transformative new space. Tell us where we are right now. We're at Prelude, a temporary performance space by The Shed to demonstrate its mission as an institution that promotes, commissions and produces all kinds of arts and artistic inventions from all walks of life. How did you get involved with The Shed and creating this structure for A Prelude to The Shed? I was invited to work with Tino Sehgal and Hans Ulrich Obrist, The Shed's Senior Program Advisor, in developing the space for events. Tino is an artist. His work is very much around physical movement and our brief was to create a space that moved. It's as simple as that. What inspired you when working on the ideas behind this project? We were to create a space that allowed different formats of performance or arts and events. So, I essentially developed an idea with my team—a space that was more flexible, pretty much like The Shed's main building, but at a human scale. While The Shed is a machine that's driven by mechanics, I was interest in something that could be transformed by human - people. We researched Tino's work and developed a solution and idea that became this shed. Understanding Tino's work — one called 'This Variation' takes place in a completely black out space. So we had to produce a structure that was both a black box and at the same time be transformed into an open public space. It's a very fluid structure that can be transformed to host different performances and art forms. It was then about refining the details to make it practical. Part of it was, how do you produce a covered space that would also be so malleable and transformable? We looked around for ideas and local solutions and it occurred to us that a simple way of creating a covered space was by using a standard industrial shed. This is conceptually an industrial shed that's deconstructed and reconfigured. Pavillion for A Prelude to The Shed. Corner of 10th Ave. and West 31st St. Photo: Timothy Schenck. Had you done other similar works? Not in form but I'm always looking to produce work that can be closer to human interaction in its mobility, assembly and fabrication. I'm curious to understand if architecture can be more human. While there's a lot of technology driving things I think, in physical space, it's interesting to explore how we can make architecture more adaptable to reflect different human conditions. Let's get into your background. Where did you grow up in Nigeria and how did you first get into architecture and design? I was born and lived most of my life in Nigeria, in the northern part. My father was an architect. I was fortunate to be raised by a father with that life and background. My grandfather was a farmer. So, more interestingly, my father did a lot of agriculture as well as architecture. That experience of my father being both an architect and a farmer had an influence on me being able to connect to environments with nature and growth. Tell us about NLÉ Works, which you founded. NLÉ is an architecture and urbanism practice focused on developing cities and communities. Not only regionally, but also as a process. We're interesting in development as a process. We work through four fields of operation: Architecture, Urbanism, Research & Education and Arts & Culture. Tell me about your project Makoko Floating School, which has got a lot of attention. It's a prototype structure developed to address the challenges of climate change and urbanization in coastal African cities. We learned from a local environment in Lagos called Makoko, where people have built for hundreds of years on water. We worked with the community to develop a solution to some of their problems, and an advancement to what they build locally. We built a second Makoko Floating School in Venice, which was technically improved. The third version is going to be built and launched in Bruges, Belgium. It's developed with a much longer lifespan as a prefabricated building system. An underlying current in your work is your outlook towards Africa and the rapid development of cities like Lagos. What are some issues you've come across in your work in these developing African cities and what solutions are you proposing? To cope with the speed of urbanization, from a point of infrastructure, our interest is to see how architecture can empower and be a tool for everyday people—things that can be easily produced by people or that use human capacity. Which is why Makoko Floating School is what it is, so that you employ human capital - both physical and intellectual resources. We're always looking at local capacities, cultural or intellectual resources. How do we stimulate cultural innovation with the challenges of urbanisation? Through arts and infrastructure. Matching that to produce low technology solutions, at same time high-performance cultural infrastructure that is versatile and adaptable at a human scale. See Kunlé Adeyemi's structure for A Prelude to The Shed May 1-13 in New York City.